Big Hungry Shelby: Are You Drowning in Overabundance? Are You Drowning in Overabundance? There are moments, in August and September, when Shawn is pulling literal buckets of vegetables out of the garden, and I actually get cranky about trying to use them all before they go bad. That's right, we wait six months for good weather and fresh produce, and then I throw a fit. I am not proud of this behavior, but sometimes I'm overwhelmed because they all come at once. But I make do. Last weekend, I got creative and used some of our harvest in creative ways. I thought I'd share the results. 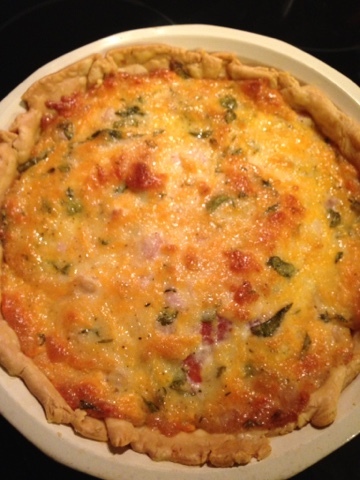 From Grits and Groceries, in South Carolina, I found a recipe for tomato pie and made it my own. This recipe I found on MyRecipes.com, and adapted it to use up some of the basil riot happening out front and some shallots I had lying around. 1. Preheat oven to 350°. Slice tomatoes into 1/4-inch-thick slices. Arrange tomato slices on several layers of paper towels over a wire rack. Sprinkle with 2 teaspoons salt; cover with more paper towels, pressing gently. Let salted tomatoes stand 1 hour, replacing paper towels on top and bottom after 30 minutes. 2. 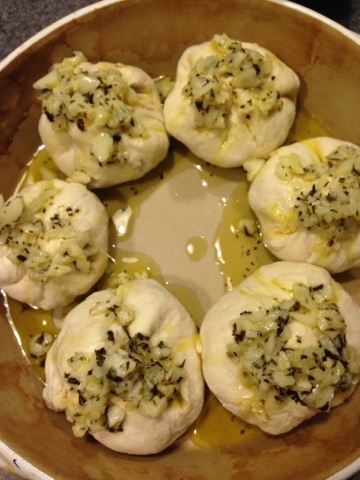 Combine cheese, mayonnaise, herbs, pepper, and onion in a medium bowl; stir well, and set aside. Roll piecrust into a 13-inch circle on a flat surface. Fit into a 9-inch pie plate; fold edges under, and crimp. Firmly pat tomato slices dry with additional paper towels. 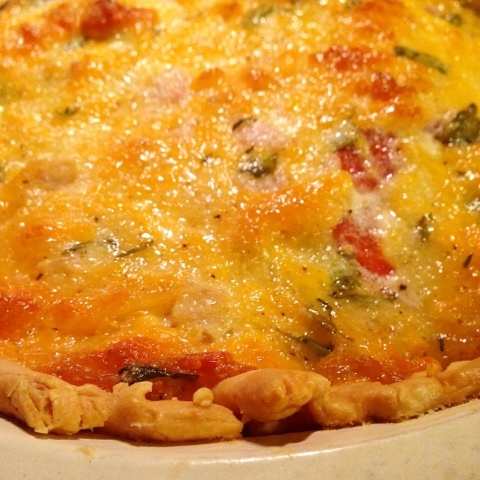 Arrange tomato slices in piecrust; top with cheese mixture. 3. Bake at 350° on lowest oven rack for 40 minutes or until golden brown. Cool completely on a wire rack. Tomato pie is a bit soggy, by nature. Make sure to really drain the tomatoes on paper towels as the recipe instructs. It tastes like a delightful combination of bruschetta and a grilled cheese sandwich. I don't think true Southern versions use as much basil as I did or sharp cheddar cheese, but as a Yankee, I need those flavors in my life. I had a bunch of beets, as well, so I scrubbed the crap out of them under running water, wrapped each one loosely in foil, and roasted them at 400 for about an hour. I took them out and let them cool completely, then rubbed the skins off with paper towels and made a salad with wedges of beet, crumbles of local goat cheese, balsamic, EVOO, sea salt and freshly ground black pepper. 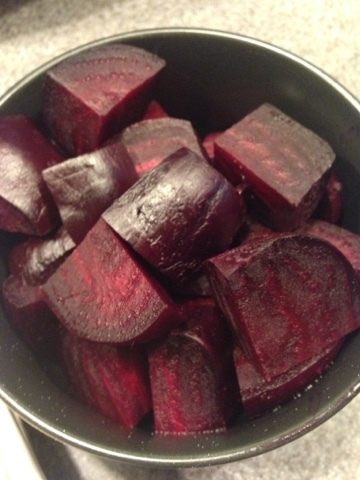 I used a ratio of about four to one, beets to cheese, and then just a drizzle of vinegar and oil. The salad is tangy and sweet, rounded out nicely by the creamy funk and of the cheese and pointed up by the flaky salt. I've already been on zucchini overload for weeks. When I recently stuffed zucchini with my usual hot Italian sausage, zucchini, onion, bell pepper, garlic, Turkish spice, and goat cheese mixture, Shawn commented that the filling would make a good pizza topping, so earlier in the week, I had made a second batch and we had pizza. But I had extra cooked zucchini mix and pizza dough left over, so Friday night, I made garlic knots stuffed with zucchini, hot sausage, and a little cheese. They were so delicious, these may be the new way I use up zucchini! I divided up the half a portion of pizza dough I had left into five, flattened each piece out a bit, put a tablespoon of mixture and a tablespoon of shredded mozzarella and provolone on top, then formed the dough around it and twisted the top. 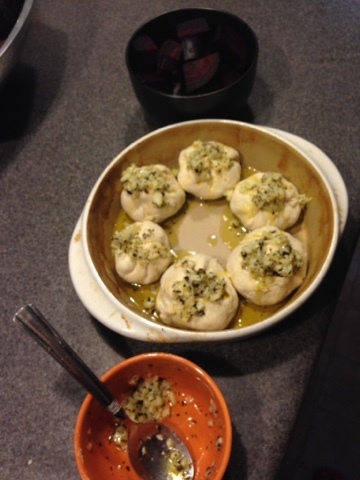 I nestled them into this baking dish, topped them with a mix of fresh, minced garlic (also from the garden), some dried Italian herbs, and olive oil. I baked them for around 20 minutes at 350. I let the garlic tell me when to pull them out; when it was golden, they were done. My at-home pizza secret? I buy Battaglini's pre-made dough in balls from the Weis. Wherever you live, I bet a local pizzeria or grocery store sells decent dough to save you the headache of multiple proofing cycles and fermented dough. What have you made with the season's abundance of veggies? Share your solutions in the comments, below! lol, you're probably just stressed about not wasting them before they go bad- so the whining is sorta justified :) That looks delicious. Yum, yum & yum. X Marks the Spot...in Endwell?